Abby is plunged into another body, this time she is tasked with reuniting the lovers. Since she wound up in a girl's room with a girl crying about her boyfriend, Abby figured she had it all figured out. There is a lot more than meets the eye with this task though. Blackmail and secrets play a heavy role in Abby task, and she has to put it together quick if she ever wants to get out of this body. 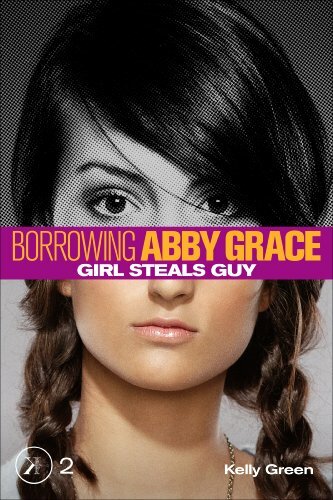 This was another fun chapter in the Borrowing Abby Grace series. Now that we know what Abby has to do with each body she inhabits, she can get right to it. In this book we find out more about the real Abby Grace. She still doesn't know exactly who she was, but she's working on figuring it out. There were lots of crazy twists and turns in this one that kept me guessing until the end. The only thing that felt a little off, was a boy being described as Leonardo DiCaprio in his heyday. Do teens still crush on Leo? I did when I was a teen, but that was 5-10 years ago. Any teens care to comment on this? This was a fun read and I can't wait to get on to the third book! "I knew I hadn't vanished completely, because if I had, I wouldn't have such a hideous headache." "I personally think that bribery isn't a proper start to a lasting love, but what do I know?"